This is the third article in the series of articles on implementing linked list with Python. In Part 1 and Part 2 of the series we studied single linked list in detail. In this article, we will start our discussion about doubly linked list, which is actually an extension of single linked list. In single linked list each node of the list has two components, the actual value of the node and the reference to the next node in the linked list. In the doubly linked list, each node has three components: the value of the node, the reference to the previous node, and the reference to the next node. For the start node of the doubly linked list, the reference to the previous node is null. Similarly, for the last node in the doubly linked list, the reference to next node is null. Unlike a single linked list, the doubly linked list can be traversed and searched in both directions. The reference to the next node helps in traversing the node in the forward direction while the references to the previous nodes allow traversal in the backward direction. Basic operations such as insertion and deletion are easier to implement in the doubly linked lists since, unlike single linked lists, we do not need to traverse to the predecessor node and store its reference. Rather, in a doubly linked list the reference of the predecessor node can be retrieved from the node that we want to delete. One of the major drawbacks of the doubly linked list is that you need more memory space to store one extra reference for each node. A few additional steps are required to be performed in order to perform insertion and deletion operations. In this section, we will see how we can create a very simple doubly linked list in Python. If you have read Part 1 and Part 2 of this series of articles, the code should be pretty straight-forward. You can see in the above code, we create a Node class with three member variables: item, nref, and pref. The item variable will store the actual data for the node. The nref stores the reference to the next node, while pref stores the reference to the previous node in the doubly linked list. Throughout this article we will keep adding functions to this class. In this section, we will see the different ways of inserting items in a doubly linked list. In the script above, we define a method insert_in_emptylist(). The method first checks whether the self.start_node variable is None or not. If the variable is None, it means that the list is actually empty. Next, a new node is created and its value is initialized by the value passed as a parameter to the data parameter of the insert_in_emptylist() function. Finally, the value of self.start_node variable is set to the new node. In case if the list is not empty, a message is simply displayed to the user that the list is not empty. Add the insert_in_emptylist() method to the DoublyLinkedList class that you created earlier. To insert an item at the beginning of the doubly linked list, we have to first check whether the list is empty or not. If the list is empty, we can simply use the logic defined in the insert_in_emptylist() to insert the element since in an empty list, the first element is always at the start. For the new node, the reference to the next node will be set to self.start_node. For the self.start_node the reference to the previous node will be set to the newly inserted node. Finally, the self.start_node will become the newly inserted node. Add the insert_at_start() method to the DoublyLinkedList class that you created earlier. Inserting an element at the end of the doubly linked list is somewhat similar to inserting an element at the start. At first, we need to check if the list is empty. If the list is empty then we can simply use the insert_in_emptylist() method to insert the element. If the list already contains some element, we traverse through the list until the reference to the next node becomes None. When the next node reference becomes None it means that the current node is the last node. Add the insert_at_end() method to the DoublyLinkedList class that you created earlier. To insert an item after another item, we first check whether or not the list is empty. If the list is actually empty, we simply display the message that the “list is empty”. Set the previous reference of the newly inserted node to the selected node. Set the next reference of the newly inserted node to the next reference of the selected. If the selected node is not the last node, set the previous reference of the next node after the selected node to the newly added node. Finally, set the next reference of the selected node to the newly inserted node. Add the insert_after_item() method to the DoublyLinkedList class that you created earlier. To insert an item before another item, we first check whether or not the list is empty. If the list is actually empty, we simply display the message that the “list is empty”. Set the next reference of the newly inserted node to the selected node. Set the previous reference of the newly inserted node to the previous reference of the selected. Set the next reference of the node previous to the selected node, to the newly added node. Finally, set the previous reference of the selected node to the newly inserted node. Add the insert_before_item() method to the DoublyLinkedList class that you created earlier. Add the traverse_list() method to the DoublyLinkedList class that you created earlier. Like insertion, there can be multiple ways to delete elements from a doubly linked list. In this section, we will review some of them. The easiest way to delete an element from a doubly linked list is from the start. To do so, all you have to do is set the value of the start node to the next node and then set the previous reference of the start node to None. However before we do that we need to perform two checks. First, we need to see if the list is empty. And then we have to see if the list contains only one element or not. If the list contains only one element then we can simply set the start node to None. The following script can be used to delete elements from the start of the doubly linked list. Add the delete_at_start() method to the DoublyLinkedList class that you created earlier. To delete the element from the end, we again check if the list is empty or if the list contains a single element. If the list contains a single element, all we have to do is to set the start node to None. If the list has more than one element, we iterate through the list until the last node is reached. Once we reach the last node, we set the next reference of the node previous to the last node, to None which actually removes the last node. The following script can be used to delete the element from the end. Add the delete_at_end() method to the DoublyLinkedList class that you created earlier. Deleting an element by value is the trickiest of all the deletion functions in doubly linked lists since several cases have to be handled in order to remove an element by value. Let’s first see how the function looks like and then we will see the explanation of the individual piece of code. In the above script we create delete_element_by_value() function that takes the node value as parameter and deletes that node. At the beginining of the function we check if the list is empty or not. If the list is empty we simply display the user that the list is empty. Next, we check if the list has a single element and that element is actually the element we want to delete. If the only element is the one that we want to delete, we simply set the self.start_node to None which means that the list will now have no item. If there is only one item and that is not the item that we want to delete, we will simply display the message that item to be deleted is not found. Set the value of the next reference of the previous node to the next reference of the node to be deleted. Set the previous value of the next node to the previous reference of the node to be deleted. Add the delete_element_by_value() method to the DoublyLinkedList class that you created earlier. The next reference of the start node should be set none because the first node will become the last node in the reversed list. The previous reference of the last node should be set to None since the last node will become the previous node. The next references of the nodes (except the first and last node) in the original list should be swapped with the previous references. Add the reverse_linked_list() method to the DoublyLinkedList class that you created earlier. In this section, we will test the doubly linked functions that we created in the previous sections. Let’s insert an element after 50. Finally, let’s add an element before item 29. Let’s now test the deletion functions on the items that we inserted in the last sections. Let’s first delete an element from the start. If you traverse the list now, you will see that item 65 will be deleted from the list. The doubly linked list is extremely useful specifically when you have to perform lots of inserts and delete operations. The links to the previous and next nodes make it very easy to insert and delete new elements without keeping track of the previous and next nodes. In this article, we saw how doubly linked list can be implemented with Python. We also saw different ways to perform insert and delete operations on doubly linked list. Finally we studied how to reverse a doubly linked list. In today’s episode we talk with Kelly Paredes & Sean Tibor. They teach Python in a middle school in Florida, and talk about this experience on the podcast Teaching Python . I love that they include physical computing right from the start, and everything else they are doing. Special Guests: Kelly Paredes and Sean Tibor. The literal definition of the word volatile is “readily vaporizable,” with a secondary connotation of “changeable.” This month’s tool matches this description nicely, as its implementation will cause the objects contained in a hashtable to vaporize, and the rate of that vaporization is indeed changeable. But more on that in a moment. First, I’ll address reader feedback from last month’s column. Half a dozen readers wrote in to inform me that the following block of code (which relates to the GlobalValues tool we discussed two columns back) is a performance bottleneck for multithreaded access. Note: A big thank you to Carl Allchin and Jonathan Allenby for initiating the Preppin’ Data project for our community. Input Excel: The data lives on a Google Drive with the ability to download as .xlsx. I initially thought it’d be cool to connect directly to a Google Sheet of the info, but, alas, we don’t have that as a connector yet. If you’d like the ability to connect to Google Sheets using Tableau Prep, upvote this idea. In this scenario, I downloaded the data from Google Drive and connected via Excel in Prep. Explore Data: It’s a good practice to explore before making changes to your data to ensure you’re not duplicating efforts. 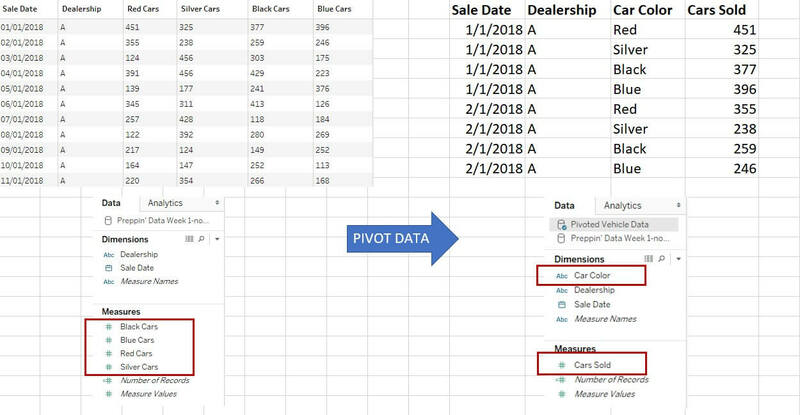 Pivot Colors: A clear beacon for pivoting occurs when you notice multiple columns representing very similar values (red cars, silver cars, etc.). I chose to pivot the data to have one column representing the number of vehicles sold, while another column described the vehicle color. Clean Color: Since I now had one column representing all car color types, I felt the word color included in each value was a bit repetitive. Using Prep’s Split functionality, I separated Blue from Blue Cars and then removed the original field. Aggregate Data: To achieve Total Car Sales per Month/Per Car Dealership, I knew the data must be aggregated. At the time, one row of information in the source described a dealership’s sales of a certain car color in a certain month (i.e. Dealership A sold 377 black cars in January 2018). I took a bit of liberty and assumed that per month/per car dealership meant the month/year (i.e. Jan 2018) instead of the summation of all years in a particular month (i.e. all Januaries). Preview After Aggregation: I like to perform a quick sanity check after any big data manipulation, and I’m glad to have noticed that Sale Date came through (to my surprise) as a datetime rather than date. This is significant because date was used later as a part of my join clause, so it’s important that the fields maintain the correct data type. Additionally, I recognized that the field created in the aggregate step was more aptly named Total Cars Sold than Cars Sold. Maintain Original: I made a decision at this point that, while I wanted to know the total cars sold per dealership per month/year, I also wanted to maintain each row individually so I could utilize the Color dimension. 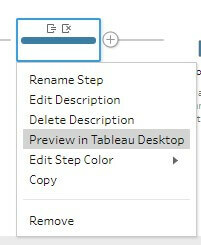 The challenge is that if a field is not used in the Aggregate step (like Color), then Tableau drops it from the flow moving forward. A workaround to this scenario is to branch off a copy of your original data and then join it back up once you’ve created the aggregate. In a way, you’re seeing both the Per Month/Per Dealership info AND the Per Month/Dealership/Car Color in the same data result. Join Flows: The common fields within the two flows were Dealership and Sale Date, so I knew those were going to be included in my join clause. An inner, left or right join would have given me the same exact outcome in this situation because the dealerships/sale dates came from the same original source. Preview Results: Since a join always brings ALL columns from BOTH tables, this caused two redundant fields: Sale Date and Dealership. After a quick clean-up, I’d arrived at my final result. Tableau Prep changed the data type of my date field from date to datetime. I’m still not 100% positive why it happened, but my assumption is that it’s due to what my selection is in the Group by level date hierarchy. Read ALL of the instructions before tackling the problem. While I’m not disappointed with the opportunity to walk us through my approach, I recognize that my result is different than the solution. 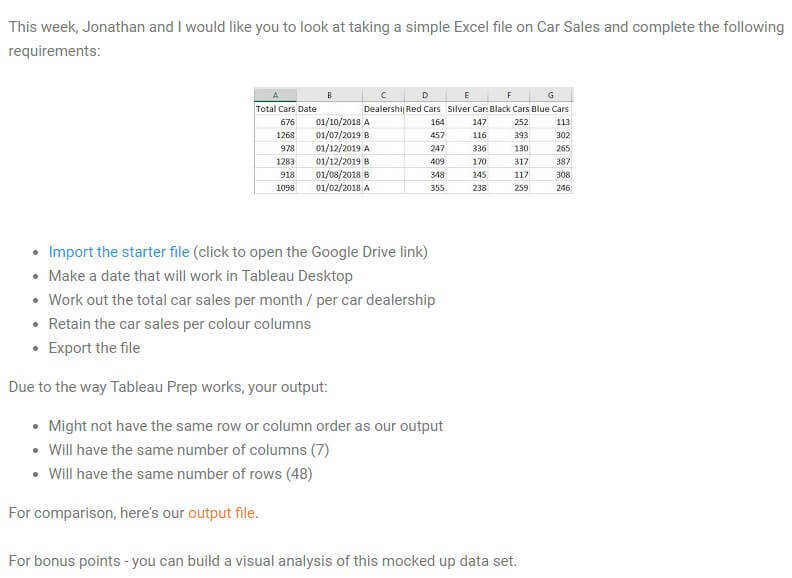 Additionally, the format of my result needs careful consideration when used in Tableau Desktop. Using the SUM aggregation when displaying the Total Cars Sold field could result in an inaccurate visualization. The post Preppin’ Data Project: Week 1 appeared first on InterWorks. $   bash --version GNU bash, version 3.2.57(1)-release (x86_64-apple-darwin18) Copyright (C) 2007 Free Software Foundation, Inc.
By default, make install' will install all the files in/usr/local/bin,/usr/local/libetc. You can specify an installation prefix other than/usr/localusing–prefix, for instance–prefix=$ HOME`.